"Ladies and gentlemen, we have detected gravitational waves!" David Reitze's announcement this afternoon was greeted by cheers and applause across the globe, including the common room upstairs from our office where we watched the press conference with physicists and mathematicians from the University of Cambridge. Reitze, the executive director of LIGO, the Laser Interferometer Gravitational-wave Observatory, announced that, on September 14 2015, they had finally detected ripples in the fabric of spacetime that were predicted by Albert Einstein all the way back in 1916. This particular instance of gravitational waves was caused by two black holes colliding over 1 billion lightyears away. "It's a historic discovery," says David Tong, a theoretical physicist at the University of Cambridge. "It's testing Einstein's theory in unprecedented regimes." A computer simulation of two black holes merging. Credit: SXS. As their name suggests, gravitational waves are connected to the force of gravity we are all familiar with. In 1687 Isaac Newton formulated his universal law of gravitation, which describes the gravitational attraction between two massive objects. The law remained unchallenged until 1905, when Einstein published his special theory of relativity. The theory says that there is a universal speed limit in the Universe: nothing can travel faster than light, that is, nothing can travel faster than roughly 300,000 km per second. This contradicted Newton, who thought the effect of gravity was instantaneous: take away the Sun, and the effect will be felt on Earth immediately. Einstein himself later remedied this problem by proposing that gravity isn't a force that wafts across the ether in some mysterious way, but a result of the curvature of space. An analogy that is often given is that of a bowling ball sitting on a trampoline. The ball creates a dip in the trampoline, curving its surface, so a marble placed nearby will roll into the dip towards the ball. According to Einstein, massive bodies warp space in a similar way, causing less massive bodies to be attracted to them. One of the consequences of Einstein's theory of gravity is that when gravitational monsters such as black holes shunt their weight around, they should create ripples that can be felt across space and time. "Near black holes the curvature of space-time is extremely high," explained gravity expert Bangalore Sathyaprakash (in How does gravity work?). "Now imagine two black holes moving around each other: the curvature is large but also changing. It's a bit like taking a stick and moving it around in a pond. That's going to generate ripples in the water. Only in the case of black holes, we're talking about ripples in the very fabric of spacetime." These ripples are the gravitational waves researchers at LIGO (and elsewhere) have been looking for. The signals observed by the two different detectors (in Hanford and Livingston) compared to theoretical predictions. The bottom plot shows the observations are in very good agreement. Image: SXS. There are two LIGO detectors, one at Hanford, Washington, and one at Livingston, Louisiana. Each detector is L-shaped, with 4km long legs either side. At the end of each leg is a mirror with a laser passing back and forth, detecting the distance between the mirrors. Gravitational waves distort space-time, which means they distort the distance between the mirrors. The precision of LIGO's distance measurements is astonishing, equivalent to measuring the distance from the Sun to the nearest star (around 3.75 lightyears away) to an accuracy of the width of a human hair. Gabriela González, the spokesperson for the LIGO Scientific Collaboration, said the effects of gravitational waves are so small, physicists will only believe they have actually detected them if they see the same event in two separate locations. The current event was first detected at LIGO Hanford, and seven milliseconds later at LIGO Livingston. The signals for the two detectors are identical, as can be seen by superimposing them one on top of the other (see the image on the left), with Livingston's signal shifted back in time by seven milliseconds. The event is "a gift of nature", says González, producing signals that are so clear they could be seen in the data by eye. where and are the two bodies’ respective masses, is the distance between them and is the gravitational constant, approximately equal to . describes the curvature of spacetime whose effect we perceive as the gravitational force. It’s the analogue of the term on the left-hand side of Newton’s equation. The other advantage of having two detectors is that they act like two ears, allowing the LIGO scientists to locate the signal to a particular region of the Universe. And this is just the start — other gravitational wave detectors coming online in Europe and Asia will add to the power to detect and locate the sources of gravitational waves. Kip Thorne, one of the cofounders of the LIGO project, said: "LIGO has opened a new window, a gravitational wave window, on the Universe." Previous windows, such as those from optical and radio telescopes, have all produced surprises, but have all used electromagnetic waves. "Gravitational waves are so radically different to electromagnetic waves there will be even bigger surprises. LIGO is just the beginning of gravitational wave astronomy." Thorne described our previous observations of the fabric of spacetime as a calm ocean. Einstein's equations have always predicted that colliding black holes would create a violent storm in the fabric of space-time. "We'd never before seen that ocean broiled in storm with crashing waves." 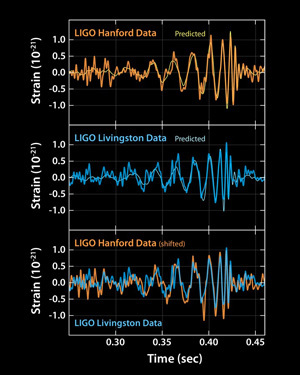 And just as you can hear the incoming of a violent storm, LIGO records the gravitational waves as sound: the gravitational waves produced by the colliding black holes sound like a small chirp against the background noise of the Universe. "This is just the beginning," says González. "Now we have detectors able to detect these systems, we'll begin listening to the Universe." David Tong agrees: "The most exciting thing is what happens next. In the near future, we could be seeing dozens of these events each year: black holes colliding, neutron stars colliding, and who knows what else. We have a new way of looking at the universe. It's going to teach us many things." In the second paragraph, should not the speed be in km/s? Yes, you are correct 300,000 km/s I think what they meant to say. I saw that and thought 300,000 meters per second - way too slow! Thanks for spotting that mistake. We have corrected it.